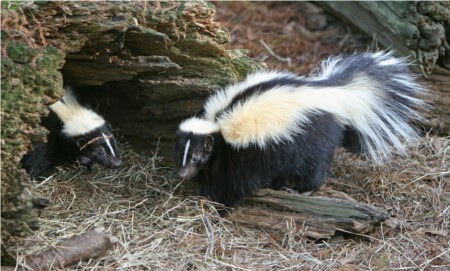 Skunks are mammals best known for their ability to secrete a liquid with a strong, foul-smelling odor. General appearance ranges from species to species, from black-and-white to brown or cream colored. There are 10 species of skunks, of which 2 species inhabit Indonesia and the Philippines; all other skunks inhabit the Americas from Canada to central South America.